Which Is Better: Gelato or Frozen Yogurt? Cold, creamy and refreshing, gelato and frozen yogurt are both frozen treats that are healthier than full-fat ice cream. 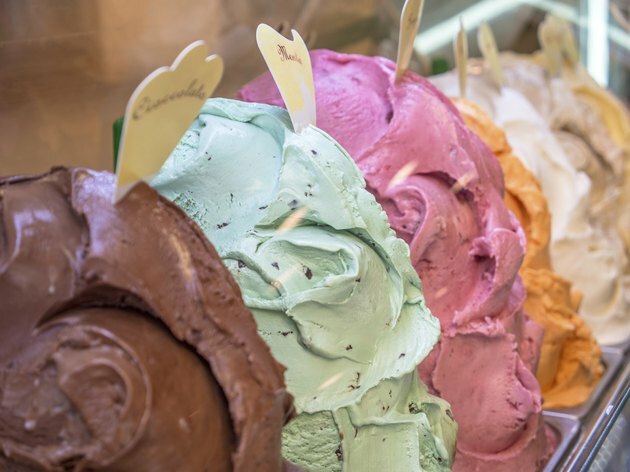 Gelato is often called "Italian ice cream" and is made with less butterfat than ice cream, while frozen yogurt is made with yogurt and milk instead of cream. Most gelato and frozen yogurt products are lower in fat than traditional ice cream, but the other nutritional information between the two differs. A 1/2-cup serving of vanilla or chocolate frozen yogurt contains about 115 calories and slightly more than 4 grams of fat, of which between 2.5 and 2.6 grams are saturated. The same amount of gelato contains 240 calories and 9 grams of fat, of which 4 grams are saturated. Some gelato products contain no saturated fat, whereas others have as much as 11 grams. A diet high in saturated fat can raise your cholesterol levels, which puts you at an increased risk of heart disease and stroke. A 1/2-cup serving of vanilla or chocolate frozen yogurt has about 17 grams of sugar. The same-size serving of gelato can contain up to 27 grams of sugar, according to the Center for Science in the Public Interest. Twenty-seven grams translates to 6.75 teaspoons of sugar, which is slightly more than the 6 teaspoons women should have as their daily upper limit and more than two-thirds of the 9 teaspoons men should have as their daily limit. If your diet contains more added sugar than these recommendations, you could gain an unhealthy amount of weight, which puts you at a higher risk for heart disease and type 2 diabetes. Frozen yogurt and gelato aren't all bad. They're made with dairy products and are a source of calcium, which is a nutrient that promotes strong bones and teeth as well as normal muscle and heart function. A 1/2-cup serving of vanilla frozen yogurt contains 103 milligrams of calcium, which is 10 percent of the 1,000 milligrams most adults need each day. The same amount of chocolate frozen yogurt has 106 milligrams of calcium. Gelato also contains calcium, but the exact amount varies among brands. In terms of calories, fat, saturated fat and sugar, frozen yogurt offers better nutrition than gelato. Of course, that doesn't mean you can't ever have a serving of gelato, but it does mean that you need to take the calorie, fat and sugar content into account when choosing foods for the rest of the day. Many large supermarkets stock reduced-fat or reduced-sugar frozen yogurt or gelato blends. Is Sugar in Yogurt Bad for You? Is Fat-Free, Sugar-Free Frozen Yogurt Bad for Diabetics? How Many Calories in 2 Teaspoons of Sugar?